You might think I tend to dwell too much on the past because of all the articles posted and references to vintage electronics companies and their employees. Maybe I do. My motivation is two-fold. First, I enjoy waxing nostalgic over the simpler, less crowded days of yore that were the 1920s through 1940s, and even into the 1950s. Things were not ideal by any means, but America was a thriving bastion of national innovation and manufacturing. A "wow" factor surrounded new discoveries and deserving heroes were created. Our friends as well as our enemies were well-defined and our schools put more effort into teaching literature, mathematics, and science than into what "rights" could be demanded without earning them. Second, which really follows from the first, is that I hope by reminding people of, or in some cases - especially younger website visitors - introducing for the first time, the fact that being a country that is fundamentally independent while at the same time playing well with the rest of the world results in a strong economy and national well-being. You can apply the principle to your own country if you are not an American. At the risk of being severely criticized, I'll say now that I think independent European countries fared better before the EU concept than they do now. Contrary to popular ivory-towered groupthink, nationalism is not an automatic precursor to warring tendencies. Now you can prove once and for all which TV is finest for your eyes! Before you spend a penny, make a side-by-side comparison. See for yourself this amazing General Electric Black-Daylight Television receiver... blacker blacks, whiter whites, sharper contrast and detail. G-E Model 12T4 offers you 140% greater range of picture tones than ordinary TV, proved in every test. Enjoy TV's finest picture, greatest eye comfort with no annoying glare or reflection. Built-in antenna - eliminates costly outside aerials in many areas. Automatic Sound - just tune the picture, sound is right every time! Choose from exquisite consoles and table models in matched genuine mahogany or blond veneers. OK, off the soap box and down to the main purpose of the page. 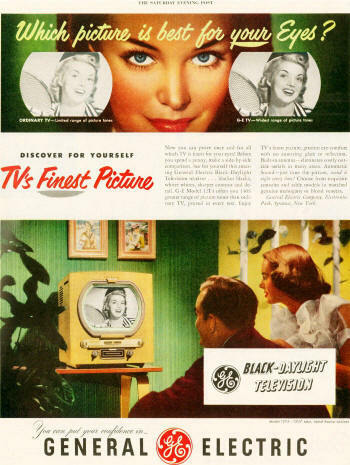 This advertisement for General Electric "Black-Daylight" television sets appeared in the April 29, 1950 issue of The Saturday Evening Post, hawking the virtues of 140% greater contrast between the whitest whites and the blackest blacks. A built-in antenna surely invoked an audible "wow" from all who read the ad, as, no doubt, did the concept of automatic volume control. A chassis made from real wood added a nice finished touch. The text mentions it was manufactured at GE's Electronics Park campus in Syracuse, New York. I worked there for a short time at the end of the last century. Only two of many buildings were still being used at the time, and then they were only partially occupied. During the era when this ad was published, Electronics Park was a thriving beehive of activity with three shifts of assembly line workers, metal fabricators, managers, engineers, technicians, cafeteria workers, building and grounds maintenance personnel, packaging and shipping workers, and many other jobs. TVs, washing machines, radios, irons, and other household items were produced by the thousands. I used to walk around the campus and look in the windows of abandoned buildings, picturing in my mind the parents and grandparents of native Central New Yorker's working hard and paying their own way in society. Similar scenarios played out all across the nation. GE invented some of its most notable early semiconductors there. No more, though. Electronics Park was sold for $1 to a commercial development firm a decade ago and General Electric --> Martin Marietta --> Lockheed Martin now leases a building or two. Oops, looks like I ended up back on the soap box. General Electric Company, Electronics Park, Syracuse, New York.